An interesting, original and creative business card is excellent marketing for your business, but it is even more cost effective when you design it yourself. This can be made in a fun, professional-like way, even if you are not a talented artist when it comes to online drawing tools. In order to get one of the most original business cards on the market, all you need is creativity and, as extra-tip, follow these simple steps mentioned below. You can get amazing design for your business cards by using programs like Adobe Photoshop, Microsoft PowerPoint, Word or Adobe InDesign. It all depends on your level of knowledge connected to these programs and experience in creating promotional materials by using them. 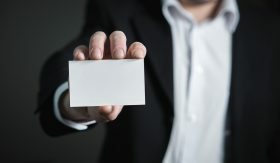 The standard size for a business card should be 2.5 x 3 inches and it should be printed on good quality paper, in order to make a good first impression. Template is very important for a business card, it helps you unleash your creativity and design a truthful pattern. Until you decide for a template that reflects your personality and your business’s note, you are free to experiment, play with colours, text, logo and other defining items. Design programs help you organize all the necessary details, so check them all and decide which one will work better for you. Like in every other area connected to design and creating your own style, colours are very important for business cards also. They can highlight important aspects from your card, so you should try working with 300 dpi resolution and using colours like Cyan, Yellow, Black or Magenta if you want to get an outstanding quality for printing. Background is very important also; you can experiment and play with colours before choosing the best one for you. Your logo should be the main eye-catching detail from your business card. Since they are the memorable aspect from this presentation document, logos should be presented as creative as possible, maybe by using 2D or 3D effects, clip arts and other useful techniques that highlight your business’s profile. Presentation texts are important, because from them potential customers should understand everything there is to know about your business. Also, fonts, colours and font size are other details you should consider. You should use at least 8pt size and two or three complementary fonts. If your business card has two sides, why shouldn’t they be used? You might need every space in order to provide information like: business name, logo, line of work, your name, title, position, work and personal phone number, email address or social media channels. Your business card is like the first impression; it could mean a lot for developing new partnership. The information you mention on it should be clear and simple, necessary after a first meeting with your future business partners, therefore do your best to make it as suggestive as possible. After you finished the design, ask for a second opinion regarding it and print it following high quality standards. Did The Simpsons Predicts Pantone’s Color of the Year?